FOLLOWING the abolishment of the Goods and Services Tax (GST), the Sales and Service Tax (SST) kicked off on Sept 1 promptly, but without a complete list of chargeable items, surprising many business operators and consumers. Property buyers should be relieved though, as property, including land, is not chargeable under SST. Legal practitioner Dominic Tan, founder of PW Tan & Associates, says under the SST regime, property buyers should expect a greater tax burden for the use of professional services rendered by solicitors, architects and engineers. Explaining the difference between the two, Tan says the GST regime carried a fixed tax rate of 6% across every stage of the supply chain. On the other hand, the SST (6% Service Tax and Sales Tax 5% and 10%) is a single-stage tax which is imposed only at production level. So, there is no overlapping of tax chargeable as the output tax will be offset against the input tax at every stage. From a mathematical perspective, the amount of tax payable during the GST regime is generally perceived as being more burdensome on consumers. “There are still some details that need to be clarified, as the Service Tax is chargeable on the services provided based on the value of the services performed, including all charges during the transaction process, which was previously chargeable under GST and the SST before it,” Tan explains. These chargeable items include miscellaneous expenses, cost of extra work, commissions, travel or accommodation expenses, and reimbursement charges for normal copying and stationery. Prescribed services such as legal services are subjected to 6% tax. However, consultants and industry players reckon that they will not impact construction cost and cost of owning a property, compared with under the GST regime as the chargeable rate then was also 6%. Associated Chinese Chambers of Commerce & Industry of Malaysia (ACCCIM) head of taxation committee Koong Lin Loong notes that because properties are not subject to SST, many may think that the cost of owning a property will be reduced. But he explains that the cost of purchasing a property may not change as there are other services involved in the construction and in the transaction of a property that are not SST exempted. The Finance Ministry has also announced a list of goods taxable under SST at end-August at a sales tax rate of 5% and 10% with a total of 5,443 consumer items exempted from the tax. However, Finance Minister Lim Guan Eng said the list will be reviewed and amended by end of the year, which means the list may be longer or shorter then. Nevertheless, as basic building materials — cement, bricks and certain steel products — are exempted items, the ministry expects housing prices to reduce. Building Materials Distributors Association of Malaysia (BMDAM) President Bill Lee says the newly-announced list of SST chargeable items offers better clarity to consumers and distributors compared to when the government first announced the return of the SST in June. In terms of price movement however, he sees no significant difference as the tax exemption item list is more or less the same as SST 1.0 where major building materials like sand, cement, steel products and bricks were exempted items. “Price movements can be affected by other factors like demand and supply, profit margin, exchange rate, overhead, and others,” Lee adds. The Master Builders Association Malaysia (MBAM) president Foo Chek Lee does not expect much impact on construction costs after the implementation of SST as industry players have become used to the previous GST system. “The only difference is, under GST, the business operators could claim back their input tax on the business purchases and expenses, but SST is a single tax system which means there will not be any input tax,” he explains. Despite this, he reckons because of the chargeable SST on the prescribed services, there will not be any significant reduction to the overall building cost. This is echoed by the Real Estate and Housing Developers’ Association (Rehda) President Datuk Soam Heng Choon’s recent comments on the SST in an earlier report. He had said construction is around 50% of the total cost in a project development and although major building materials are exempt from the SST, there are still other essential components such as prescribed services and products which are chargeable under the SST. It is understood that the construction process involves over 200 building materials and services such as glass, sanitary ware and roofing — most of which are taxable. 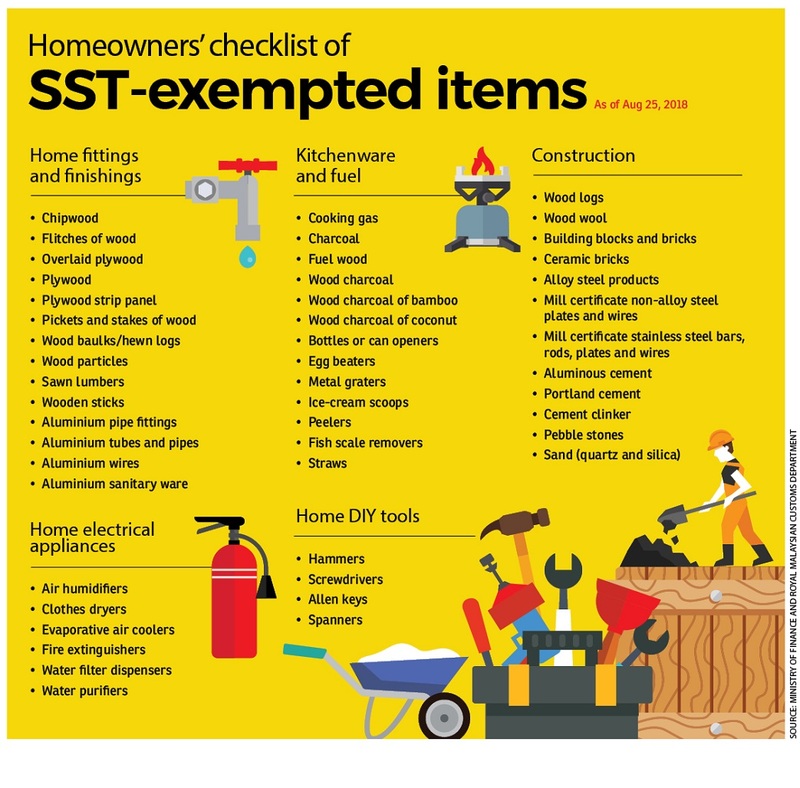 Hence, unless more building materials are categorised as SST-exempted items, property buyers should not expect significant impact on property prices. However, in recent news reports, Penang Rehda chairman Datuk Toh Chin Leong was quoted as saying that the prices of homes in Penang that cost RM300,000 and above would be reduced by 10% while affordable homes priced under RM300,000 would see a 6% price reduction. He said this is in line with the government’s decision to exempt certain building materials from the SST, which was previously taxable under GST. However, we have yet to see any developer actually lowering their prices under the SST implementation. Previously, when the new government announced the zero-rated GST on property transactions back in May soon after the 14th General Election, a few developers announced price reductions of their properties. For instance, Hillcrest Gardens Sdn Bhd had reduced the selling price of its latest development — Hillcrest Heights @ Taman Puchong Utama, by 3% right after the announcement of zero-rated GST. The comeback of the SST spells good news for some commercial space tenants who paid costly fees under the GST as rental is no longer chargeable under SST. “In the GST era, tenants needed to pay 6% of the rental value to the property owner, if the property’s annual rental exceeds RM500,000. For most office spaces in the city centre, almost all easily surpassed this threshold,” says Koong, who is also the CEO of accounting and tax consultancy firm K-Konsult Group. Hence, he opines that the SST will indirectly bring down the cost of doing business in Malaysia, making our country more attractive. Tan from PW Tan & Associates concurs that the introduction of the SST is likely to have a positive impact on the property sector. “Commercial and industrial property buyers will benefit the most, as there will be an immediate tax savings of 6% as no SST will be imposed under the new tax regime. The same goes for developers who intend to acquire land bank for commercial or industrial development – the property to be acquired is also exempted from SST,” he adds. Lee from BMDAM lauds the abolishment of the GST as it could improve building material distributors’ cash flow condition and reduce some of the current hassle in doing business. “GST was a cost in doing business because while we needed to provide credit terms to our customers up to 60 days, we also had to pay cash for our imports and purchases. GST has to be remitted to the Malaysia Customs Department by end of the following month regardless whether debts had been collected or not,” he adds. Besides this, he says some distributors also faced difficulties in claiming back GST refunds as there were possibilities that their request could be declined or subject to a field audit by Customs. Koong emphasises that unlike the GST, a multi-stage tax system, SST is a single-stage tax that only applies to manufacturers or importers of taxable goods and prescribed service providers. Moreover, only companies or service providers which exceed RM500,000 (or RM1.5 million for F&B operators) annual turnover threshold per year can charge SST on services provided to consumers. “For non F&B operators, the threshold amount is only limited to the value of the services excluding the value of the product, as the goods have already been charged 6% sales tax and shouldn’t be double-charged on consumers,” he further elaborates. For instance, if one has purchased a water heater and requires installation services, he or she can be charged the 6% service tax only on the labour fees, and even then, only if the company’s annual service fee revenue exceeds RM500,000. For F&B operators, as its business nature entails both goods and services in one, the financial threshold is set at a higher level of RM1.5 million. This story first appeared in the EdgeProp.my pullout on Sept 21, 2018. You can access back issues here.